See how many people are in the building, and how many in each room. 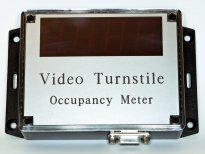 Occupancy shown on meters and on computers. Monthly, weekly, daily, hourly, half-hourly, etc count-files stored on central computer. Count-files can start from your opening time. Same system also monitors queues and waiting times. In a Video Turnstile occupancy monitoring system, overhead CCTV cameras are linked to intelligent people counting units. People are detected entering and leaving rooms. Counts are saved by the units and sent to occupancy meters and Windows computers. Highly configurable for individual situations, the system can handle both bright and dark rooms. Find out more: get a quote, send us an e-mail or telephone +44 (0)161 834 6688 for more information on monitoring occupancy.